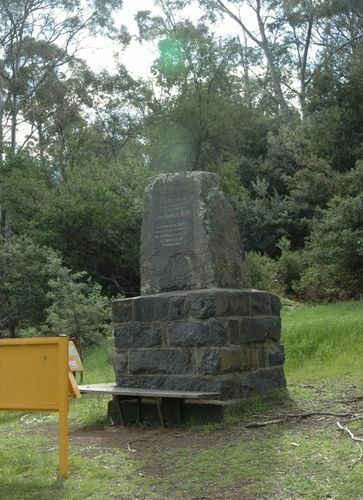 Monument commemorates the centenary of the landing of Lieutenant-Governor John Bowen of the Royal Navy who established the first-ever British settlement of Tasmania. Bowen arrived with 48 settlers aboard the vessels, Lady Nelson and Albion, at Risdon Cove, situated on the River Derwent in southern Tasmania, on September 12, 1803. Faced with hardships such as poor soil and low rainfall, the site was badly chosen. With the arrival of Captain David Collins in February 1804, the site for a permanent settlement was moved from Risdon Cove to Sullivan’s Cove (the present site of Hobart). John Bowen left Tasmania (then called Van Diemen’s Land) somewhat disillusioned with how he had been treated by officialdom. He was never to return. The important historical site of Risdon Cove, where Bowen settled in 1803, was given by the Ray Groom Liberal Government in 1996 to the Tasmanian Aboriginal Lands Council (TALC). It is the second oldest settlement in Australia, and the only historical site which remains much as it was two hundred years ago. The monument has suffered from vandalism and neglect since 1996. The centenary of the foundation of the colony was auspiciously celebrated today. The weather was beautiful. Business was wholly suspended, and the city was brilliant with bunting, while the streets were thronged with people. The great function of the day was the unveiling of the memorial obelisk at Risdon, to commemorate the first landing of Lieutenant Bowen. Their Excellencies Sir Arthur Havelock and Vice-Admlral Fanshawe took part. The warships Mutine and Torch fired a salute of 17 guns, and there was an impressive aquatic display of local craft in Risdon Bay. Steamers were laden with sightseers, crowds also lined the banks of the river, and the scene was unique in Tasmanian annals. One special feature was the handing of the deed of gift of the land whereon the obelisk is erected. This was done by Mr. Albury, the donor. The Sydney Morning Herald, 23rd February 1904. This memorial erected to commemorate the Centenary of the landing at this spot of Lieut Bowen, RN on 13th September 1803, was unveiled by His Excellency the Governor Sir A. E. Havelock, G.C.S.I., G.C.M.G., G.C.I.E.